Despite a teenage obsession with Isaac Asimov’s Foundation series, I’ve never been particularly drawn to hard science fiction. As such, I approached the Three-Body Problem without much in the way of expectations. The story concerns scientists in the People’s Republic of China over the last fifty years, as they grapple with the discovery of alien life. The aliens, dubbed Trisolarans, live a harsh and precarious existence due to their planet’s incomprehensible orbit around three suns (a peculiarity from which their name is derived). They discover Earth thanks to the efforts of Ye Wenjie, a disillusions astrophysicist who sees in alien life a means to curb the excesses of humanity, which she believes cannot be trusted to govern itself. She partners with an idealist billionaire named Mike Evans, with whom she forms the Earth-Trisolaris Organization (ETO), a body with the traitorous objective of ensuring Earth falls under Trisolaris’ control. Much of Trisolaris’ history is explained through a cryptic video game called Three Body, which was designed to recruit new members to the ETO. Through it, we learn biological quirks of the Trisolarans, and gain a crash course on the titular three body problem, which involves efforts to calculate the interplay of three different objects through orbital mechanics. As a genre, hard science fiction is traditionally more concerned with ideas than characters, and the Three-Body Problem follows this template while providing just enough personality to keep the protagonists engaging enough to follow. The dialogue can come across as clunky, though I hesitate to criticize this since it may be an effort to capture the rhythms of Chinese in translation. There is also a lot of blatant exposition in the dialogue, a common trope of hard sci-fi that I find a little irritating. However, it was neither frequent nor egregious enough to pull me out of the story, and much of the science is handled deftly enough for novices to absorb through the text without descent into clunky footnotes. In contrast to the sometimes stiff dialogue, the prose is slinky and lyrical, yet understated, its crisp, clear sentences filigreed with illuminating images. Liu peppers the text with similes where other writers would likely employ metaphors, a decision that I wondered might come from the story’s Chinese origins—this is merely speculation, since I speak no Chinese, but the smattering of Asian poetry I’ve encountered in translation is similarly filled with such devices. 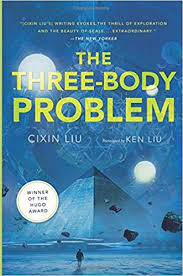 The Three Body Problem is book one of a trilogy, and very much feels incomplete on its own. However, it drew me in enough that I will be sure to seek out the sequels in the near future.